Daniel Hilton canvasses for a Democrat in Georgia's House District 107, where Republicans went unchallenged for decades. 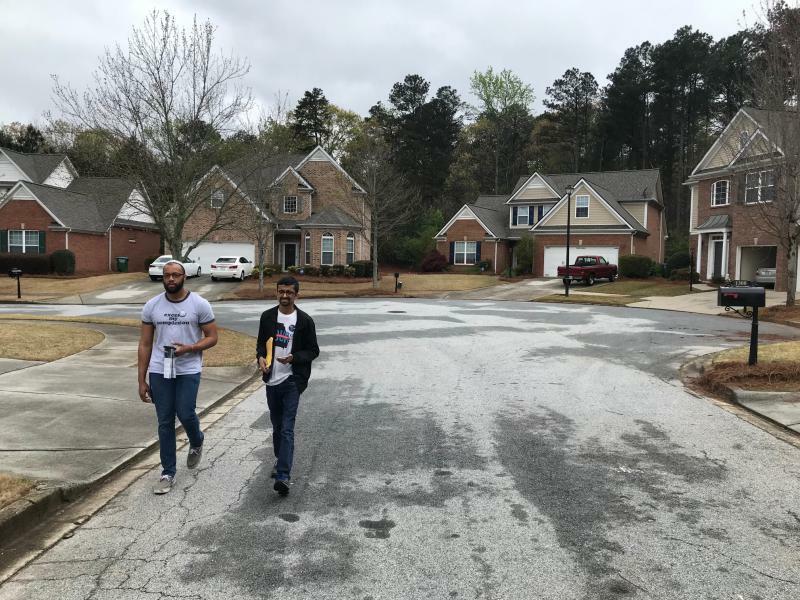 Daniel Hilton and Krupesh Patel knock on doors in a Snellville neighborhood, trying to rally enthusiasm for primary voting in Gwinnett County. Gwinnett County Democratic Party Chair Gabe Okoye at HQ. Georgia Democrats are hoping 2018 is the year Gwinnett County finally turns blue. Five Republican lawmakers are either retiring or running for other offices. Democrats are working hard to mobilize voters ahead of the May 22 primary and keep them energized into November. 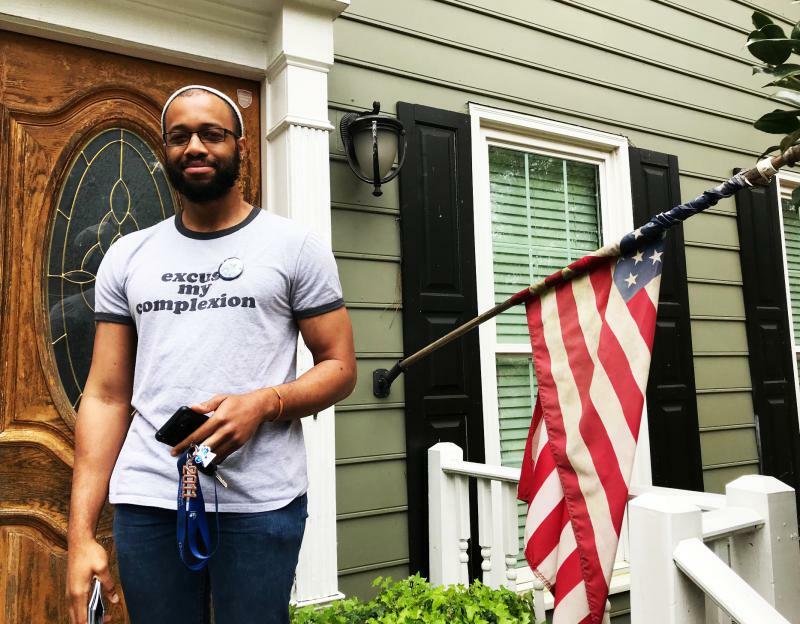 Daniel Hilton is walking through a suburban neighborhood in metro Atlanta, holding his phone in one hand, and campaign materials in the other. His T-shirt also has a message: “It says Excuse my Complexion," Hilton explains. "It’s not very subtle, but at the same time it does start a conversation." He’s 25, and campaign manager for Shelly Hutchinson. She’s one of two Democrats vying for a state House district where in the past Democrats haven’t even bothered to run. But long-time Republican incumbent David Casas is retiring this year. And he’s among an exodus of GOP incumbents opening the door for competition from both parties. Hilton uses an app on his phone to target Democratic voters. He knocks on door after door in this Snellville neighborhood before one opens, and he gives his spiel: “How you doing, sir? My name is Daniel Hilton with the Shelly Hutchinson campaign…. She’s running for Georgia State House. The first Democrat in over a decade to run for this seat." The interaction is brief and overall, positive. But the man behind the door is one of only five people to open up in this part of the canvassing turf. Hilton says part of the problem is no one is expecting him. After decades without competitive political races, people in this district may have never been canvassed before. The mood is more energized at Gwinnett’s Democratic Party headquarters later that day, where a couple dozen volunteers are getting trained as canvassers. Laura Raymond teaches them the do’s and don’ts of going door-to-door, and helps run the party phone bank. 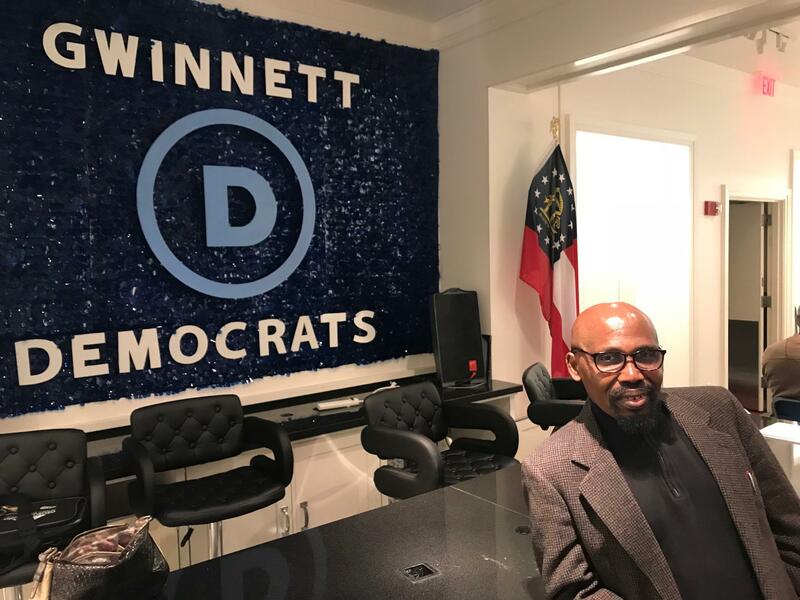 County Party Chair Gabe Okoye says many more people are coming to party meetings and events since Hillary Clinton became the first Democratic presidential candidate to carry Gwinnett since Jimmy Carter. “There’s so much energy in our party that we have to restrain it or it would be catastrophic. You can’t just let so much energy go uncontrolled. So, we’ll do what we can to channel it properly for maximum results,” he says. Okoye adds part of that is making sure there are qualified candidates in down ballot races, not just at the top. “We have gone from a situation where we didn’t have anybody, except the top on the ballot, to where we are contending with about 10 or 12 primaries right now,” he says. Of the campaign flyers laid out, the vast majority are for women candidates, people of color or both. Emory University political scientist Andra Gillespie says this shows politics is catching up with demographic changes in suburban Atlanta. But historically, most voters don’t pay attention to primaries, especially during non-presidential years. Four years ago in Gwinnett, only 14 percent of those registered actually cast ballots. “But for the sake of democracy it's really important for both parties to reach out to as many voters as possible and to do the job of educating voters about their primary elections in May,” Gillespie says. Take Gwinnett’s 105th state House district. The race was decided in 2016 by just 222 votes. And with three Republicans competing to replace a retiring incumbent this year, primary voters decide who the GOP’s new candidate will be. The deadline to register to vote in Georgia’s primary is Tuesday, April 24.